Our mission to uncover the most stunning adventures at the most spectacular sites is going so well, we’ve got a host of new adventures, treks and tours for you guys ranging from canoeing, slackpacking to over night Kloofing! This year we have so much planned and we look forward to seeing you all outdoors and indulging in the adrenalin frenzy! GARDEN ROUTE ADVENTURES: The Cape is renowned for great food & wine festivals, it also has fabulous rock. We’ve combined some of our favourite festivals with our favourite adventures, check out the diary below. Some highlights include Overnight Kloofing at Baviaans Kloof, our Knysna Slack packing trail and a hectic Rock Climbing weekend at Montagu (check out the Port festival option below) and a really stunning canoe challenge for Team building which takes place on the Knysna Lagoon – hey, if you’re from out of town, let us know, we’ll arrange the whole thing for you, flights, transfers accommodation and of course ADVENTURE! GAUTENG ADVENTURES: Great news for Gauteng abseil junkies, we’ve got a fantastic new rock site in Cullinan near Pretoria for our Abseiling and our Hike, Climb and Abseil adventure, 50m of extreme adventure – we’re running an introductory special at this site (March to August) to get you guys out into the sunlight, best you email & ask for details. And if that wasn’t enough incentive to get out of the city, join us for Raft and Abseil from Monday to Friday from March to August and you’ll also get a discount. Don’t forget that Kloofing season comes to an end in May so get your bookings done now! Remember ALL of our adventures are available 365 days a year, well 366 days this year. An overnight Kloofing Adventure in the Baviaans Kloof Mega Reserve is a rough and ready adventure not to be missed but only if you can take the pace… We camp in the wilderness, hike, scramble, climb, abseil and swim our way through pristine gorges in this unspoiled wilderness area. Are you prepared? That’s the question you really need to ask. 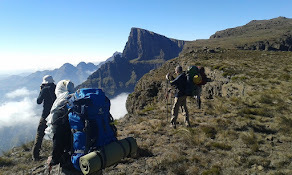 16 days of wilderness trekking across the Drakensberg Mountains from The Sentinel in the North to Bushmans nek in the South, The whole Transberg is a big challenge, but what an amazing experience. Arguably the toughest trek in South Africa.